It’s been a busy month at iBeat. We’re in full swing with manufacturing and internal user testing and are excited at how quickly things are coming along. As you may have read in our last update, we received our first batch of testing-ready watches and battery chargers. Upon rigid testing, including everyday wear and tear, though, we noticed a couple minor flaws. 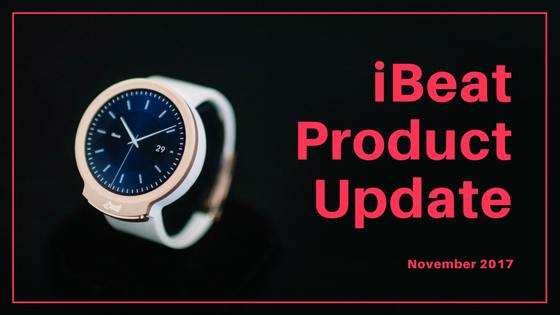 We feel the the watch band material and battery charger are not at the level of quality we want, and thus have had to make the tough decision to push back the shipping date of all pre-ordered iBeat watches. We designed the iBeat Watch to be comfortable for all-day and all-night wear, and the current materials do not reflect that. While the current materials are beautiful and elegant, the band needs some refining. The good news? These issues are fixable, and we are working to make the updates now! We are also looking to expand our current network carrier partners and evaluating new partners to provide you with the most cell coverage possible. We feel this is especially critical in rural areas and are taking every measure to make sure our standards are met. We refuse to settle for mediocre coverage and will work to get coverage across not just one, but hopefully all U.S. cell networks. We are now targeting an April 2018 shipping date. We apologize for the delay, but at the end of the day, we want to make sure you get something you love (and that we are proud of). And we can promise you, it will be worth the wait. We understand some of you cannot wait this long and would like to offer you an alternative option. We are beginning outside beta testing in early 2018 and are looking for individuals who can wear the watch and provide detailed feedback (we will loan and send you an iBeat Watch free of charge). If you are interested in being one of our early beta testers, please email our Head of Sales and Support, Omari Starks, who can get you on the list. Shoot him a note at omari@ibeat.com. In the coming months, we’ll keep you updated on our progress. In the meantime, if you have any questions, concerns, or general feedback, please feel free to email us at support@ibeat.com.